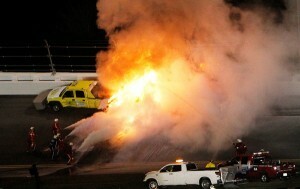 Home » Sports » Nascar Driver Tweets from Car! Wow! Nascar Driver Brad Keselowski does what a social media addict does. He tweets right from his car during the race. Holy cow! Did he tweet while driving? well, the answer to that would probably be a No. 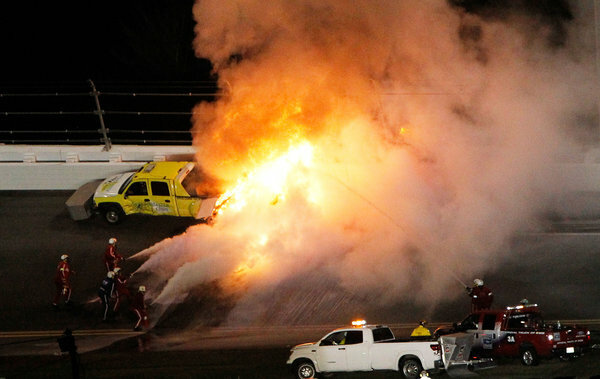 Keselowski’s fellow driver Juan Pablo Montoya crashed into a safety vehicle mid-race. The collision and jet fuel — the safety vehicle reportedly holds 200 gallons of jet kerosene — sparked a huge ball of fire, although both vehicles’ drivers appeared to avoid serious injury. The race was halted. From his spot in the racecar traffic jam, Keselowski sent tweets to his less than 85,000 followers and ended up getting a 184,000 followers on the whole in just 1 hour. Anyway, he ended up with an accident later when the race resumed. As the saying goes, dont use mobile while driving. Bet the driver learned it a hard way. Previous: Oscars 2012 Winners List!